Conservatory Designs operate from a state of the art showroom featuring eight permanent displays at Johnstown Garden Centre, Naas Co. Kildare. This showroom which is open seven days a week showcases the very best in glazing technologies with a range of colours, sizes and designs on display. We carry the full range of all styles of conservatory – Victorian, Edwardian, Lean To, Pavilion and Bespoke – as well sunrooms, orangeries and garden rooms. We have now installed over 4,000 conservatories around Dublin, Kildare and Leinster and are the well known as the conservatory experts. Conservatory Designs offer a fantastic range of Brightspace sunrooms with the client having total choice in the section of roof materials and designs. We offer shingle, tiles or slate for the roof with a plastered ceiling inside. If your old conservatory is looking tired or would you like the benefit of the additional insulation available now why not give your conservatory a make over and create a new room that you can enjoy 12 months of the year. 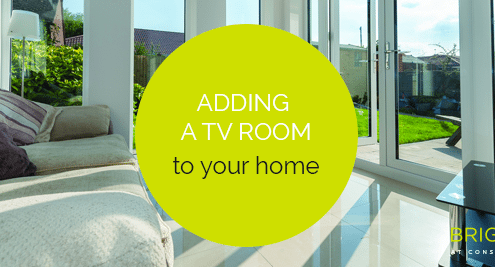 We offer a host of other home improvement products including our Ultrawarm PVC windows, doors and composite doors, the Ultrawarm range of replacement glazing for existing windows where we can leave your window frames in place and replace your glass with Ultrawarm glass. 2019 sees the launch of our Brightspace range of conservatories, sunrooms and home extensions, to read all the info and get great tips on your new project download our new 40 page brochure packed with great info, photos and ideas. Please click on the photos below to see our full range of Conservatories, Sunrooms, Orangeries, Windows and Doors. PROJECT: Remove old Conservatory and replace with a new Sunroom that could be used as a TV Room. PROJECT: Add an open plan dining room to a dark and small kitchen to create a bright and open plan living area. PROJECT: Change the small kitchen from an area to a large and bright living and dining room, a new space where all the family could congregate together in the one area. Our design office on site currently offers a service where we can design your new Conservatory, Sunroom or Orangery in minutes while you watch allowing you have full input to the process and make changes as we create your new room. We can then print off the designs for you to bring home. Please note an appointment is required for this service. no surprises during the build. Read what some of our customers say about our conservatories, sun rooms, garden rooms and more! Really happy with our Conservatory conversion to a Sunroom. We feel it is now part of our house after removing the sliding doors. The whole design team were great to deal with from start to finish, got daily updates on the project from the office.We would highly recommend Conservatory Designs. Really professional and wonderful to deal with. From our very first contact, they were professional and did exactly what they said they would and when they said they'd do it. They were extremely clean during some messy work and between Christine, Trish and Mark, they were in constant contact with us. Wouldn't hesitate to recommend them to anyone. We are thrilled with end results. I recently had a large sunroom built by Conservatory Designs. It's an extension open into our home. I chose it above a standard build extension, I think it's better value. An important factor for me was that you can have a high portion of solid wall in a sunroom. On completion, it's well insulated and airtight. I've worked with trades people for most of my career, and appreciate more than most that there's good and bad out there. The service provided was to the highest level, from all aspects, start to finish. Exact pricing and timing. 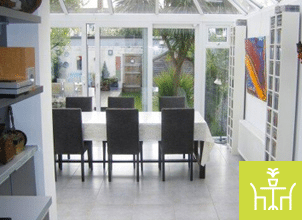 I'm delighted to recommend Conservatory Designs to anyone who wants to extend their home. I found the whole team at Conservatory designs helpful, professional, friendly and always available. As a single person I was happy to hand my keys over while I went into work while they went about building a beautiful conservatory exactly as I wanted it. If you want quality and service and a stress free experience, I would highly recommend this company. Fantastic service, I wanted an unusual shaped conservatory to replace one that was in disrepair and arrived at the showroom with a hand drawn sketch . Peter and Mark gave me great advice and the guys turned my sketch into a wonderful conservatory that I am delighted with. From start to finish they were on hand , nothing was too much trouble, every question was answered and the job was finished to schedule. Worth every penny. From the start of our Sun room roof conversion I found your team to be very professional . First time 15 years we can enjoy our Sun room . I would have no hesitation in recommending this wonderful company . I had a Conservatory renovation done by this company in April 2018 .. I couldn't fault anything . From the initial sales and planning meeting at my house right through to completion , everything went smoothly . Everything happened when it was supposed to, all done within the time frame predicted and finished to a very high standard . Nothing was too much trouble . The workers were all very pleasant , helpful and polite . Every day they cleaned up and there was never any unnecessary mess. The owner was very hands on , checking in most days . The project was finished very much to my satisfaction . I now have a glass Conservatory which is suitable for year round use and now more like a room IN my house . I just could not recommend Conservatory Designs at Johnstown highly enough. Conservatory Designs, did a truly fabulous job on our new extension.From start to finish, their attention to detail was incredible. We could not recommend the company and the staff highly enough. We were kept updated daily with progress reports from Naas and also what to expect the following day. "Mark" has the patience of a "Saint"!- In short, great job- well done. Nigel & Susan McFarlane. We got a new roof on our conservatory and replaced the glass in the windows and doors. The room is now totally insulated and much warmer. The team were totally professional, with great communication throughout and the work was finished to a very high standard. I would have no hesitation in recommending them. Great job from start to finish by Conservatory Designs - new conservatory roof and glass replaced throughout. Conservatory is noticeably warmer and more comfortable with the upgrade (December). We had to change the windows in the house we bought. The service was exceptional. The team is highly professional with a great sense of humour. In less than 4 hours they managed to remove 4 old windows and install the brand new ones with all the extra plastering and insulation. When they left it was like no one was in the house except the it's like the new windows magically had replaced the old ones. Very clean work with attention to the smallest detail. Highly recommend and will definitely will use their services again. I would highly recommend this company! They are all gentlemen with lots of respect for customers and their property. Lovely team! 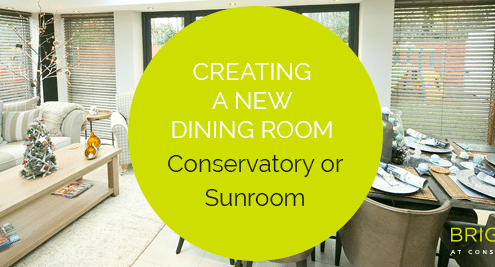 We are delighted to have chosen Conservatory Designs to replace our sunroom and windows. We would highly recomend them to anyone.We were contacted each evening by Christine or Trish to check on works done and to inform us of the next stage.We would like to thank Mark Peter and all their teams for their Professionalism Punctuality and Cleanliness.Regards Tom & Eileen. We wish to thank Mark and Peter and the fitting team who recently put a new roof on our conservatory. We had no hesitation in going back to Mark and Peter at Conservatory Designs, who built the original conservatory, which has given us years of happiness without any problems. As expected, they came on time, constructed what we had asked for and all at good value for money. We would have no hesitation in recommending Conservatory Designs to anyone considering any building work at their home. Very pleased with the work done from the start to the finish. From the design and various suggestions everything came together. Started and finished on the date they gave us. The work crew were very professional at their work and very pleasant. Highly recommend Johnstown Conservatories for the work they do. Cannot speak highly enough about our experience with Conservatory Designs. From start to finish everything surpassed our expectations. On the initial site survey we were advised how to make the most of our new build - but no hard sell involved. Timetable was laid out in advance to suit our needs and was completed well before due date. Tradesmen were of the highest standard both in the work that they did and how they communicated with our family and neighbours. We required a lot of additional features but nothing was too much trouble. In summary I cannot recommend this company highly enough. To say that we are delighted with our new sunroom is an understatement. It would be difficult to find perhaps impossible to find such a fine tuned efficient team as was available top to bottom ,start to finish from Conservatory Designs. From initial contact with Mark to design with Peter and very efficient office team and highly skilled fitting team Carmel and I are very happy and satisfied clients and would be willing to showcase project if requested. We were extremely satisfied with conservatory designs. They were a pleasure to work with. We would highly recommend them to anyone. Worked very efficiently and great lads on site. Thanks for a great job done and good wishes to your business in the future. kind Regards Joe and Bridget Dermody. I would recommend Conservatory Design to anybody. They are professional, efficient and courteous. They rightly have an excellent reputation. They were great at all stages of the process - from planning to design and construction. We were so pleased with our sunroom that we've had them back to do some other jobs since. 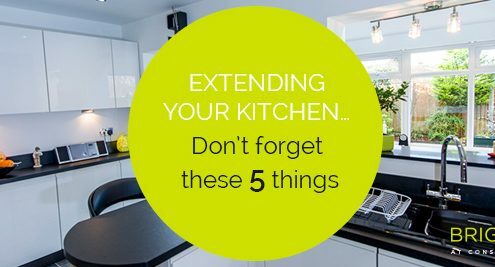 We've also recommended them to neighbours, friends & family. Mark is one of the best sales people I've ever met - he really listens to the customer & has never steered us wrong. He has a huge network of tried & trusted tradespeople that he's worked with for a long time. Really Delighted with our new doors and windows. Highly professional service from start to finish. Would highly recommend. We contacted Conservatory designs via their website as we decided to replace our polycarbonate roof on our conservatory to a full new roof and replace the double glazing also. Within a day Mark made contact with us. Mark called to our house the following week by appointment and explained every detail re; the cost, estimated build time and materials to be used. The price we were quoted was very competitive and great value, with the product being of a high standard. The fitters were at all times very courteous and considerate of our needs and impressed us with their attention to detail. They worked quickly and cleanly and in a very professional manner. We would highly recommend Conservatory Designs.Kind regards,Damian and Jo Hogan, Skerries, Co Dublin. In April 2018 we had a replacement conservatory installed by Conservatory Designs, Johnstown, Naas. On completion of this project we are very satisfied by all aspects of the work carried out by a highly efficient and professional Conservatory Designs project team. This project was made easy for us resulting from our our first contact with company representative Mark Quinn , who clearly outlined the different aspects of the task in hand. The installation of the conservatory, which was overseen at all stages, was carried by very experienced staff members who took pride in their work, without any disruption to family life. The project was completed within schedule.Best wishes to Conservatory Designs for the future. I would highly recommend Conservatory designs for any building work that needs carrying out. From our very first email and consultation with Mark, he was approachable, detailed and available to answer any questions we had. The whole team from start to finish were very nice, friendly and trustworthy, and kept the site very clean during the build while keeping in contact to ensure that we were happy with the progress. We are absolutely delighted with the finished extension and look forward to using it all summer. When we decided to build a sun room, we had three criteria, Top Quality Finish, Fully Integrated with the Existing House and A Price That Was Value for Money. We did most of our research online and settled on Brightspace at Conservatory Designs. Every interaction from start to finish was effortless. The design phase was smooth and the all staff were very helpful and customer orientated. Once we nailed the design, the real work started on the agreed date. The quality and manner of the workforce was really important to us. We were going to live in each other’s ears for 4 weeks so it had to be good. It was. Every day ended with a cleanup and a time commitment to an arrival time the next day. The 4 weeks flew and though some technical challenges arose we sorted them between us. Today we are at the final stages of finishing a beautiful room, fully integrated, top quality finish and the kicker – due to some innovative and creative ideas the price even came down a little. We are completely satisfied and look forward to enjoying our beautiful room – thank you. Work was accurately quoted for and design carried out to ensure our conservatory conversion to a sunroom was carried out as and when agreed. 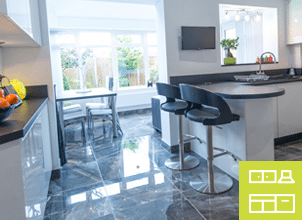 All involved from Conservatory Designs carried out work to an extremely high standard from design to build and ensured minimal disruption to our existing conservatory floors and walls etc. Our Conservatory had been installed 15 years earlier by guys from Johnstown and had given us no trouble at all in intervening period. All structural, electrical and plumbing works on our sunroom conversion were carried out in very professional, accomodating and friendly manner. We are delighted with end result and would have no hesitation in highly recommending Conservatory Designs. Many Thanks to all involved. Excellent experience from start to finish. Mark was just brilliant as was Donal, Frank and the rest of the crew. Couldn't fault anything. We are delighted with our new room and would highly recommend Conservatory Designs. I cannot recommend Conservatory Designs enough. Everything was absolutely effortless, from the initial phone call to the onsite consultation right through to the final day of building. I felt like my needs and wants were listened to and taken into account every single step of the way in order to ensure that my dream conservatory and porch were created into a reality. All the office staff were so friendly, courteous and helpful time and time again as were all the workmen who were very punctual, mannerly and neat leaving my house exactly the way they found it with no disruption. If you are looking to get a conservatory look no further than Conservatory Designs because they are absolutely worth every single cent. Many thanks to Mark and all involved in the planning and building of our Conservatory. The workers were very clean , courteous and helpful at all times. The job was started and finished on schedule.We are really delighted with the end product. I had a wonderful experience with Conservatory Designs, Johnstown, Naas. Much to my surprise I now have a fantastic space added to my living area. After much research into companies who build conservatories in Ireland I was led to Johnstown, and I was not disappointed. Every step of the process showed excellence in knowledge and workmanship. Each team of workers were great to work with. They were truly professional, and worked consistently and hard every day. When they said they would do something they followed through. There was great coordination. At the end of each day I got a call to make sure that everything was going well. Thank you to every member of the team. I am so grateful for the wonderful job you have all done and I highly recommend Conservatory Designs, Naas. I got a conservatory built on to the back of my house during the late Summer/early Autumn by Conservatory Designs Ltd. I found the professionalism of the whole team, from planning, design, attention to detail, construction and fitting very commendable. It was a pleasure doing business with all concerned and the channels of communication were always first class. I'm now delighted with the finished product and it is a wonderful addition to my living space. I would certainly recommend the Company to anybody considering getting a conservatory built. The Team from Conservatory Designs Johnstown are excellent! Mark, Peter, Joe, Niall and Jim have made the experience of renewing our conservatory roof, as painless as possible! The consultation in preparation was thorough and extremely professional. The reassurance from Mark that, “we will get this sorted for you”, was most certainly realized! Joe, Niall and Jim worked very efficiently and methodically. On completion of the work, the follow up has been most reassuring. We are very happy to recommend Conservatory Designs to one and all!! ? I'm delighted I chose Conservatory Designs to build our sunroom and I would recommend them to anyone. Their professionalism is second to none. Mark contacted us everyday to check on the work. The builders were all nice to deal with. And because they had to go through our house everyday, they insisted on cleaning the house up as how they found it every single day when they finished work. Most importantly the building quality is great. The sunroom turned out better than we expected. All in all a big thank you to everyone on the team from us! 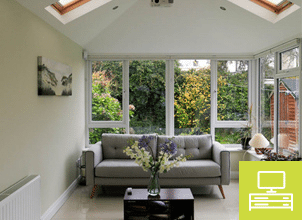 Conservatories, Sunrooms And Orangeries. We Are The Industry Leaders In Ireland. Our Brightspace range offers many exciting possibilities for extending your home to create more space or to adapt the existing space to be usable in all seasons. 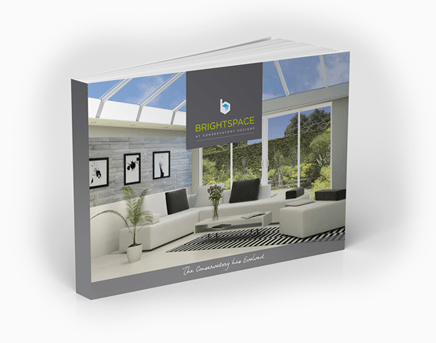 The Brightspace range includes glazed roofs, solid roofs, Orangeries and Energy efficient windows and doors.